In today’s market, it is important for associations to offer continuing education and professional development courses that broaden the horizons of their members as well as keeping them informed of industry trends. 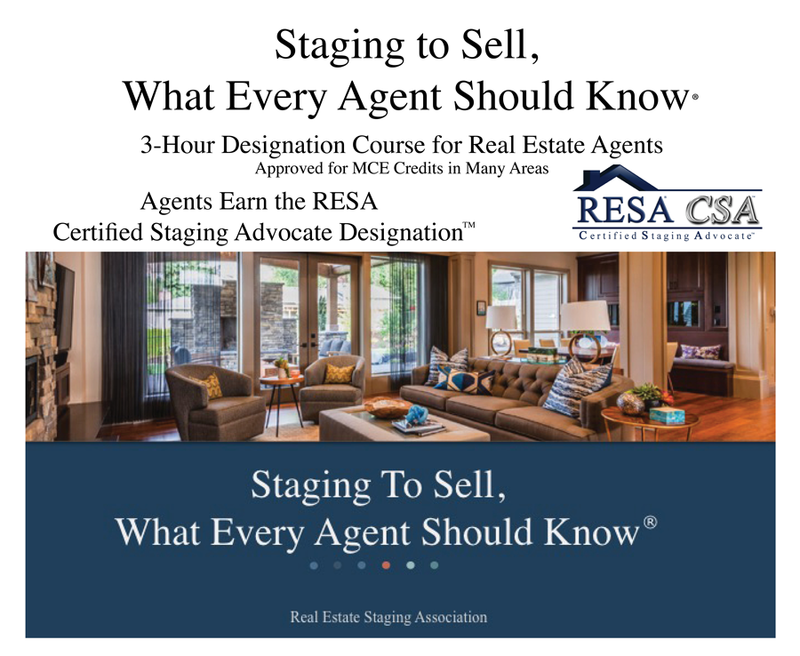 Why choose RESA for your real estate staging education? RESA Approved Instructors are required to pass a vetting process that includes submitting an application and references, as well as submitting a video demonstrating their speaking skills. Instructors are required to take a Train the Trainer class as well as pass a teaching exam. RESA Approved Instructors are required to hold the RESA-PRO designation, which is a higher-level designation based on passing an ethics exam and adhering to a strong Code of Ethics. Affordable class and completed in only 3-hours. Agents earn the RESA-CSA designation. RESA-Certified Staging Advocate. RESA-CSA Designation Only- All other states and Canada. If your state is not listed for credits please let us know, we are happy to apply to your state.